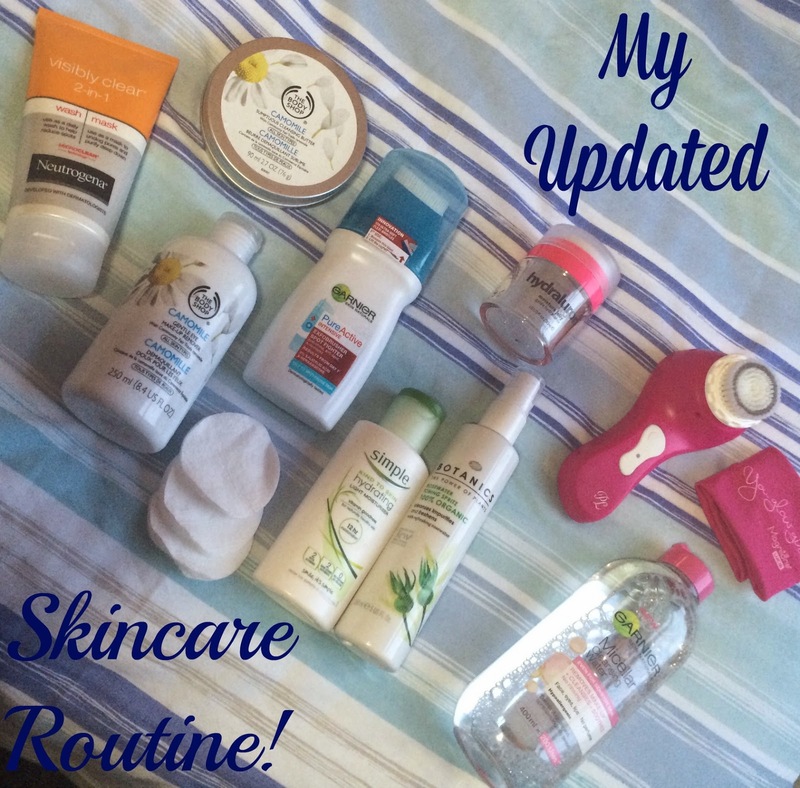 Beautiful You: My Updated Skincare Routine! I asked on twitter recently if any of you want to see this post and I got an overwhelming response most of whom said yes, hence here it is! I've been changing up my skincare routine a lot recently to try and make it better and turn it into something that I can stick to easier. This is what it has come down to and I am loving it at the moment because it is easy to do before my shower so it doesn't seem like too much extra effort. I will talk about the products in the order that I use them because that will probably make it easier for you guys (any myself!). So I don't think the first step has changed since last time but I just take my Body Shop Camomile Eye Make-Up Remover on a cotton wool pad and remove any make-up on my eyes, using one cotton pad for each eye. Then I take another cotton pad and put a liberal amount of the Garnier Micellar Water and remove the rest of my face make-up and to do the first cleanse of my face. After these steps I will go into the bathroom and work my Body Shop Camomile Cleansing Butter into my skin, making sure that you have covered all over your face. I then wet a flannel with warm/hot water and remove all of the product from my face, doing this with the warmest water you can stand really extracts the dirt from your pores. I will then take my Neutrogena Visibly Clear Daily 2 in 1 Wash & Mask and apply this over a damp face. The next step has to be my favourite, I get my Pixie Lott Limited Edition Magnitone and work the cleanser into my skin for a minute making sure that you get all over your face, this really cleans deep down in the pores and gives amazing results. I have done a review on the full sized Magnitone which I will link here so you can go and see what I thought, I'll give you a clue I loved it! I will then take my flannel again and wipe the residue that was left on my face off and make sure it is thoroughly clean. Then last step for now is a new product that I have tried recently and I had to share it because I cannot believe how good it is. It is the Garnier Skin Naturals Pure Active Exfo-Brush Wash and you just apply this to a damp face in circular motions and then wipe away the access with a flannel or cotton wool pad. Then the last two steps of my skin care I do after I have had a shower as I tend to do my skincare in the evening. I take my Rose Water Toner and spray this liberally on a cotton wool pad and then just take that all across my face, just to make sure that there isn't any make-up or dirt left on there. Then lastly I either take my Indeed Lab's Hydraluron Moisture Jelly or Simple's Light Moisturiser and apply a pea sized amount all over my face. I use the moisture jelly twice a week on a Monday and a Friday and then the rest of the time I use my standard moisturiser. I just think that the moisture jelly is too expensive to use on a daily basis and I have seen a difference already regardless of not using it daily. I hope you all enjoyed seeing the skincare that I have been using recently, I thought that I would make this one a little but more detailed because it seems to really work for me and I wanted to share my tips and tricks with you all. If you have any skincare products that you think I should use or if you use any of the same products then let me know in the comments below! I also just wanted to put a little comment at the end of this post saying thank you for getting me to 1K on twitter, you are all amazing! I love reading skincare routines, and yours was no exception. Great post. And, congratulations on reaching 1k on Twitter! Loving your routine! I'm a huge fan of The Body Shop's cleansing butter too!